Delroy Williams is an important part of the surface support team. His ability to learn and utilize new skills is proving to be of great value to the JCO. Delroy's main contributions to the Organization are in rigging, communications, and crowd control. His assistance at Hutchinson's Hole on February 1 and 4, 2004 was invaluable and was a key factor in the successful completion of the JCF assignment. 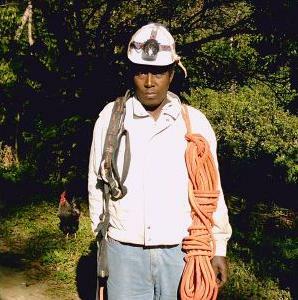 Delroy has shown a keen desire to learn vertical rope techniques and we fully expect to have him on-rope in the near future.